The laying hens are producing eggs like crazy. We had a hiccup earlier in the season but that has been fixed, and eggs are rolling out of the mobile pens like crazy. The girls love their soft straw beds. We purchased milk crates without a logo on them...it just did not seen right to use them emblazoned with some other farm name on them. After using a variety of other materials we realize that the open bottoms of the crates are perfect: eggs do not fall through the holes, but other messes do. The hens, who eat a GMO free mix of feed and move across the field in their pens, produce a wide cross section of beautiful eggs. Multicolored and multishaped. And the eggs have a wonderful flavor. We have been raising laying hens for years. It is easy for us to eat a dozen eggs in a day: in an omelette at breakfast and in some other egg yumminess at dinner. Scientists have told me our eggs will lower cholesterol, yolks and all, because of the consumption of grass, that the biochemistry of the bird is different than a bird in a chicken house. As the girls move around, scratching in the dirt, clipping grass off and eating the entire blade, finding spots for dust baths, hopping into their beds of straw to lay eggs...they make a lovely sound. A contented little sort of purring sound. If we had every laying hen we have purchased over the years our flock size would be close to 1,000. We have 200 active layers, and another 150 growing. Some of the hens are 5-6 years old. Some were given to us: people tell us their hens don't lay, drop them off, and the hens begin laying again. We have never butchered a laying hen: every creature loves chicken and over the years we have been attacked by most. Earlier this year we selected a few and put them in a separate pen, inside the garden. We were certain these hens were too old to be laying, certain we were feeding them just to eat. And they laid eggs! Just like that. And regular since. 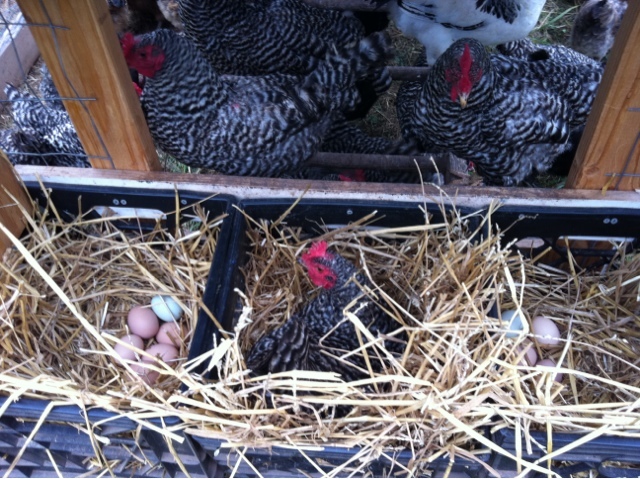 And those gals lay big eggs, and usually the double yolks. Their straw beds get wrapped tight, into a nest. A circular pattern every day, which we pull apart to clean, to shake out chicken leavings in an effort to have clean eggs. Collection is a couple of times each day, to ensure that no one gets a taste for them. Egg eating chickens are not cool. Must be time for breakfast.